Description: A Monument is erected in front of a stone wall. 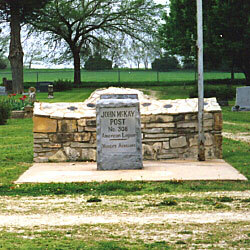 The Monument is inscribed: "John McKay ~ Post ~ No. 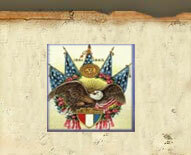 308 ~ American Legion ~ Women's Auxiliary". A Bronze Star, reading "GAR ~ 1861 ~ 1865" is mounted on the stone wall. 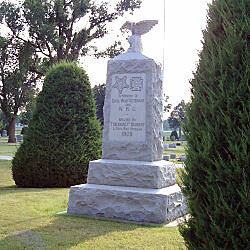 Description: A Granite monument surmounted by a stone eagle is inscribed: "In Memory Of ~ Civil War Veterans ~ And ~ W.R.C. ~ Erected By ~ Theodore P. Burkert ~ A Civil War Veteran ~ 1929". 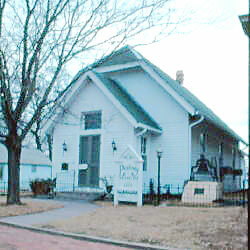 Description: This frame building in the town of Peabody has a plaque mounted next to it which explains: "Erected 1874 ~ First Free Public Library ~ Building in Kansas ~ Acquired in 1925 By The ~ Woman's Relief Corps ~ As An Assembly Hall For ~ The Grand Army Of The Republic ~ And Its Auxiliary ~ The National Woman's Relief Corps". The building is now used as the Peabody museum. Description: The inscription on the large granite monument reads: "In Memory of the ~ Defenders of the Union ~ 1861-1865 ~ Erected by the Peabody WRC ~ 1900". A small marker in front of the original reads: "In 1900 the Peabody Women's Relief Corps Post 99, Auxiliary FOR ~ Peabody Post 89 of the Grand Army of the Republic purchased this ~ plot to erect a monument honoring the men who served in the Union ~ Army during the Civil War. 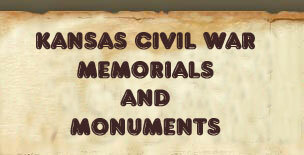 Through various fund raisers and selling ~ of subscriptions they were able to raise the $750 for the monument's ~ cost. A design was chosen and it was ordered in 1900. The monument ~ was unveiled and dedicated at the Memorial Day ceremony in 1901. The ~ Women's Relief Corp post in Peabody was founded in 1887. They were ~ involved in many charitable endeavors during the life time of the post ~ which disbanded in 1969. 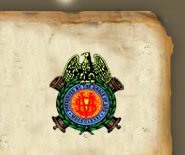 Peabody Grand Army of the Republic Post ~ 89, a fraternal organization for the Union Civil War veterans was ~ founded in 1882. 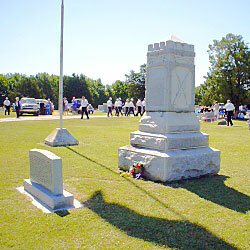 The Peabody Prairie Lawn Cemetery is the final ~ resting place for over 140 Union Civil War veterans. ~ This marker erected Memorial Day 2001 by the Peabody Historical Society ~ on the 100th Anniversary of the Monument's unveiling and dedication."